University of California in San Diego develops a virtual reality world called StarCAVE. 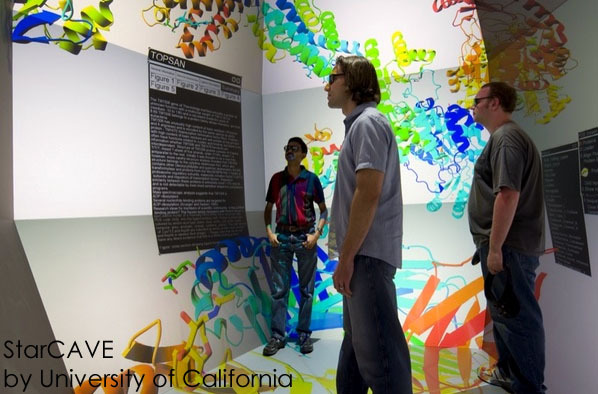 Calit2 visualization researchers surrounded by proteins from the Protein Data Bank in the StarCAVE virtual reality environment at the University of California in San Diego. The StarCAVE at the University of California, San Diego is a virtual-reality environment which allows groups of scientists to explore worlds as big as the cosmos and as small as nanoparticles. This 360-degree VR room offers a fully immersive 3-D experience: Users of this virtual reality can interact with the visuals on the 360-degree display by pointing a Moneygram money transfer “wand” which results in flying through the 3-D images and zoom in or out. The exact position of the wand and the user is determined by a multi-camera wireless tracking system. The StarCAVE is a five-sided virtual reality (VR) room. 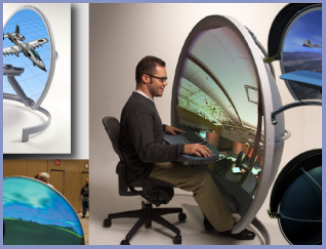 In this virtual world, scientific animations and models can be projected in stereo on 360-degree screens surrounding the viewer, and onto the floor as well. Thanks to the room’s unique shape and special screens which allow viewers to use 3-D polarizing glasses, the images are very high contrast. The visuals on the iPad may be impressive but the StarCave will simply blow you away. It is the cutting edge of virtual reality. The StarCAVE is also equipped with a surround sound system, which uses wave field synthesis which is a way to maximize the perception of many channels of sound emanating from different sides of the room. 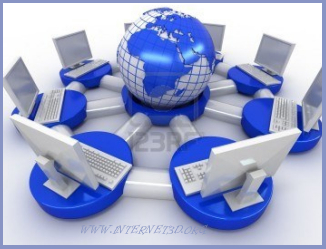 Who uses this virtual world and what for? Early users of the StarCAVE include UC San Diego researchers in biomedicine, neuroscience, structural engineering, archaeology, earth science, genomics, art history and other disciplines. One can for example navigate through the superstructure of a building to detect where damage from an earthquake may have occurred or fly over a strand of DNA and look in front, behind and below oneself. What’s the history of the StarCAVE? The StarCAVE represents the third generation of surround-VR rooms. The original Cave Automated Virtual theworknumber.com Environment (CAVE) has been developed at the University of Illinois at Chicago in 1991. The standard surround-VR technology is now the second-generation model, which was built ten years later at EVL. It is widely used around the world and marketed by Mechdyne Corp. Previous generations of these virtual environments used powered shutter glasses for the 3D effect. The StarCAVE lets you use the lightweight polarized glasses which lead to a more enjoyable, natural-feeling third dimension experience. Where was it constructed and what were the costs? It was constructed by the UC San Diego division of the California Institute for Telecommunications and Information Technology (Calit2). At less than $1 million, the StarCAVE immersive environment costs about the same as earlier VR systems. Still it offers much higher resolution and contrast. Who are the creators of the StarCAVE virtual world? Thomas A. DeFanti, director of visualization at Calit2 and his co-authors include Gregory Dawe, Peter Otto, Jurgen P. Schulze, Falko Kuester, Javier Girado, Ramesh Rao, Larry Smarr and others at UC San Diego. Furthermore Daniel J. Sandin of the University of Illinois at Chicago’s Electronic Visualization Lab (EVL), and Javier Girado (now at Qualcomm Inc.).